she heard from her mother’s piano, her father’s vinyl records, her siblings’ CDs and from the clubs she frequented on Manhattan’s lower east side. Having gathered stories from musicians and fans she met while on tour, Eljuri went back into the studio to record her second solo album in 2012. This time recording songs with a ferocious yearning to express her anger and give voice to atrocities we as a global society were witnessing. The album’s title, ‘Fuerte’ was intended to encourage strength and the courage to stand up for what is right, what is true and what we can change using the power of our voices. For over a decade, Eljuri has performed on world renowned stages; at Vive Latino, Mexico’s most celebrated music festival attended by more than 250,000 enthusiastic fans; the Luminato Festival where she made her 2015 Canadian debut; the Houston iFest where she shared the main stage bill with Los Lonely Boys, War and Steel Pulse; at Chicago’s famed Millenium Park where the Chicago Sun Times proclaimed “Eljuri among the best bets, at the Viva Chicago Music Festival”; as featured international performer and guest of Doctor Krapula at the Viva el Planeta Festival in the Bogota Sports Stadium, Colombia; at the 2015 Mujeres Al Frente Fest in Guadalajara, Mexico where she headlined her first festival; in 2016 as headliner of the Prismatic Festival in Halifax, Nova Scotia and as a leader of the Women’s Movement in 2017 for the Festival CDMX por los Derechos de las Mujeres held on the iconic stage in the main Zócalo of Mexico City, at the 2018 Women’s March on NYC and looks forward to her first performance at Musikfest 2019 in Bethlehem, PA.
Self-described as a songwriter primarily, Eljuri found herself digging deeper than ever before into both her Spanish and Lebanese roots and into her experience as an immigrant to the US for the collection of songs on her third solo album, ‘La Lucha’ (Manovill Records 2016). Eljuri reaffirms her relevance in a constantly changing global music landscape. You get what you need, and you make what you need. Eljuri wrote a motivating theme to inspire her sisters and brothers who are in the fight against injustice for the long haul. Her message and the title of the track is ‘Keep it Up’. Caught off guard and inspired by this undeniable tune, Eljuri and her label, Manovill Records, decided to record and produce ‘Keep It Up’ in time to release the song before the 2018 midterm elections in the United States. This was the first time Eljuri released a single independent of an album. 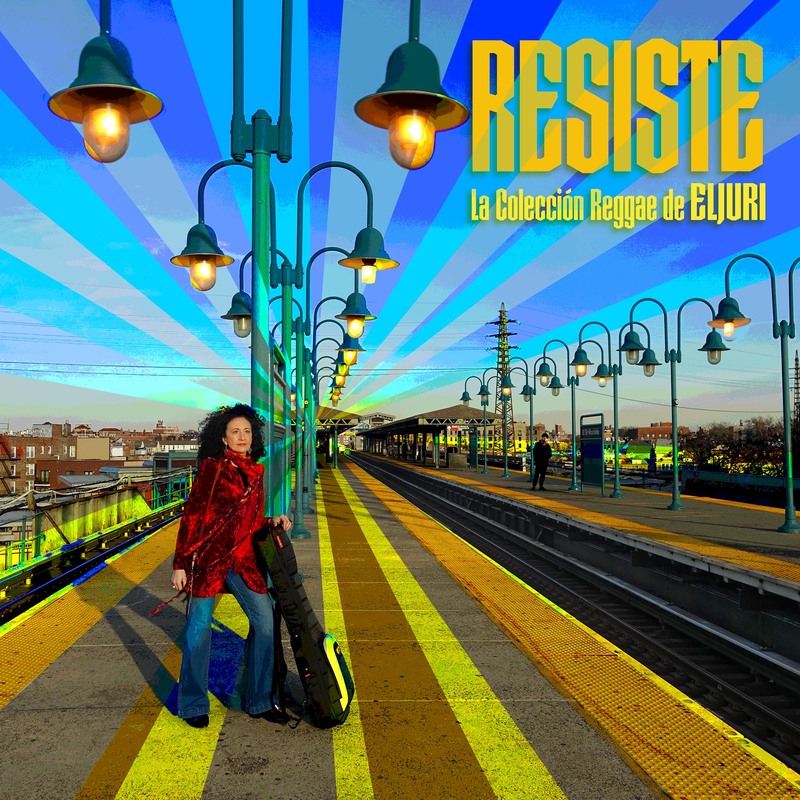 With new material and a refreshed look to her collection of original reggae songs, Manovill Records released ‘Resiste: La Colección Reggae de Eljuri’ on Friday April 12, 2019. No stranger to the reggae genre, Eljuri comes to this juncture in her career naturally. She has been writing reggae tunes since her early days with the Trouble Dolls on New York City’s lower east side. 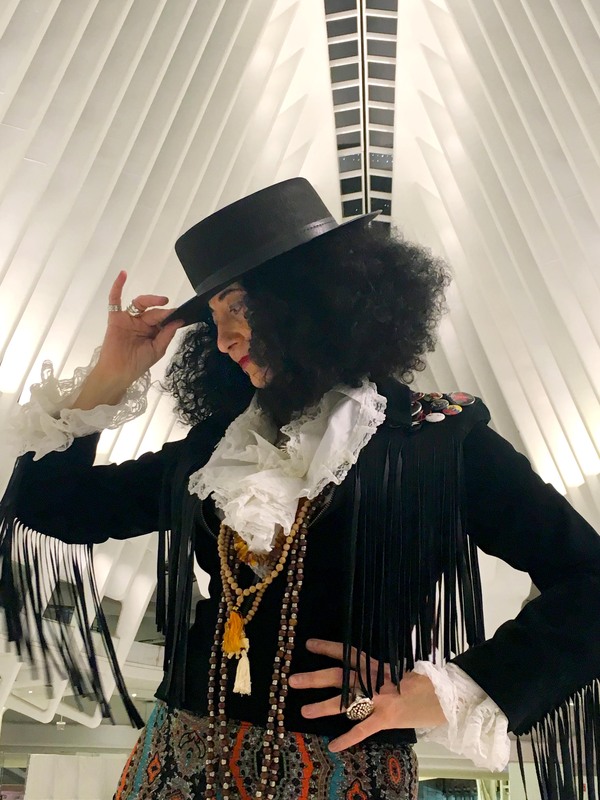 True to her activist self, Eljuri ripped the lyrics for ‘Resiste,’ the title track and first single from the collection, straight from today’s headlines. Also included on the album are the songs ‘Una Ola’ and ‘El Aire‘ from her debut album ‘En Paz,’ which were deemed roots-reggae by Dermot Hussey the legendary broadcaster and musicologist; and winner of the John Lennon International Songwriting Contest (World Category) Eljuri’s anti-gun violence song ‘BangBang’. Eljuri performs as a power trio; touring with stellar professional musicians, many of whom have played with her for five years or more. Cecilia Villar Eljuri leads on guitars and vocals; with Alex Alexander, drums (David Bowie, Youssou N'Dour, Eminem), Winston Roye, bass (Soul Asylum, Shakira, Lauren Hill), Johnny Pisano, bass (Deborah Harry, Marky Ramone, Ryan Adams), Tracy Wormworth, bass (B52s, Sting, Wayne Shorter), Coca Cortes, bass (Los De Abajo) and Javo Sosa, drums (Maldita Vecindad). As a musical activist, Eljuri has been a lead organizer for the Women’s March on NYC since the original march in January 2017. Through benefit performances and by lending her music to globally significant causes, Eljuri has helped to raise funds for immigrants to the US through a benefit concert for the NYCLU, for victims of the recent earthquake in Ecuador and has built clean water centers with and serves on the Boards of ViaTalenta and Aquality International (formerly Water Ecuador). 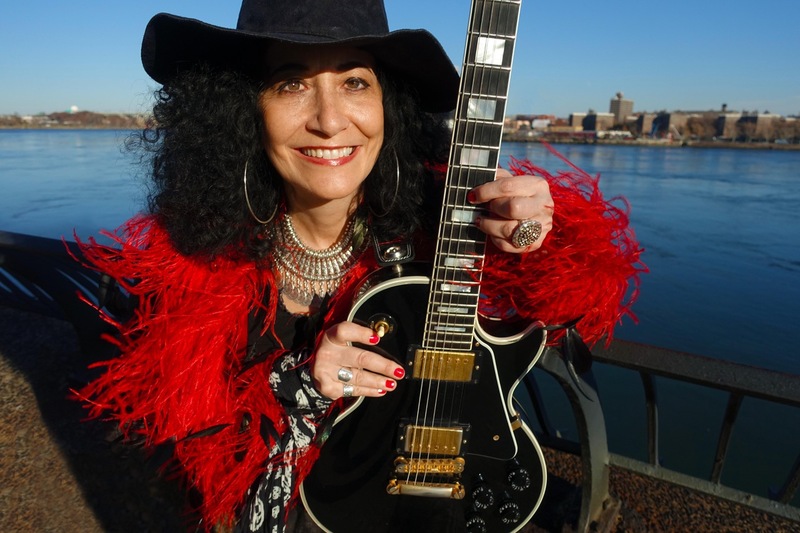 She developed and offers her bilingual ‘Eljuri on Guitars / Eljuri en las Guitarras’ workshops to schools, community centers and as a master class to music schools for aspiring guitarists and musicians. As a role model to the Latinx community, Cecilia leads her ‘Artivism: How to Find and Use Your Voice / Artivismo: Como encontrar y usar su propia voz’ and emphasizes the importance of education and music as a vehicle of expression at engagements including as a keynote speaker at Columbia University / Barnard College. She serves as a member of the artist coalition for VotoLatino, a US based organization that provides culturally relevant programs to empower Latinos to be agents of change and to build a more inclusive democracy and the Women’s March Alliance helping to raise awareness about the organization’s work. Eljuri has garnered awards for her songwriting from Billboard, the USA Songwriting Competition, and the John Lennon Songwriting Contest, twice, was designated a finalist in the 2018 World Citizen Artist Awards, and was just named the winner of the 2019 Songs for Social Change Songwriting Competition by the Renaissance Artist and Writers Association. ‘Ya Es Hora,’ her video about a soldier returning from service and suffering from PTSD was selected as an official video to five international film festivals winning Best Music Video at the 2015 Voiceless International Film Festival. Her original music has been heard in movie scores (Solitary Man, Snitch, Away from Here) and on internationally syndicated TV shows (NCIS LA, Dexter, ESPN, From Spain with Love, Privileged, One Night Stand with Annie Sibonney, I Used to Be Fat, Workin' Moms). 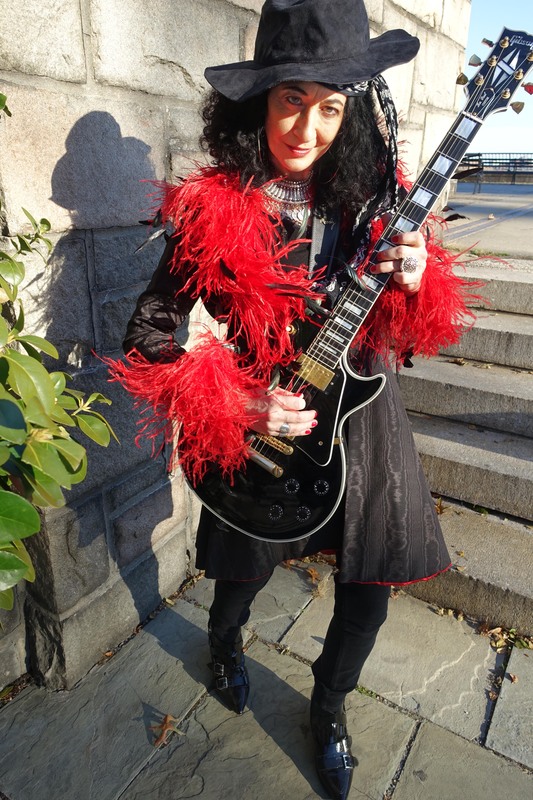 Eljuri proudly endorses Gibson Guitars, D’Angelico Guitars, JH Audio Custom In-Ear Monitors, Mono Cases and Moody Guitar Straps. 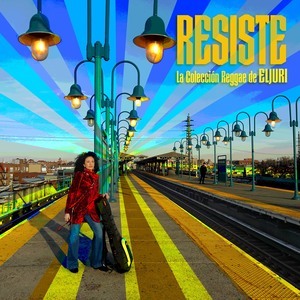 New York, NY – Manovill Records delivers today ‘Resiste: La Colección Reggae de Eljuri’ available on all digital platforms. Through her own powerful reggae music, Cecilia Villar Eljuri is inspired as an artivist to express our troubled times with this her fourth release as a solo artist. Planeta Rock Radio, Interview, 10/22/2016, Planeta Rock Radio ELjuri La Lucha. The collection includes original Eljuri songs including three co-written with the infamous Jamaican reggae duo Sly & Robbie. Her songs ‘Una Ola’ and ‘El Aire‘ received heavy rotation on terrestrial and satellite radio and were praised as ‘roots reggae’ by Dermot Hussey, the legendary broadcaster and musicologist. 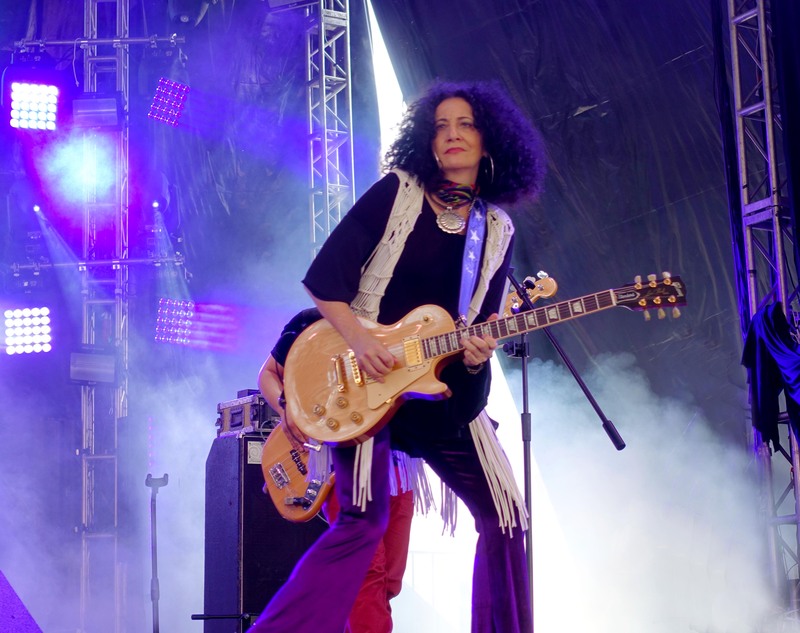 Touted as one of the top Latinx guitar players in the world, Eljuri has been digging deeply into her guitar world and exploring new sounds for her live performances. 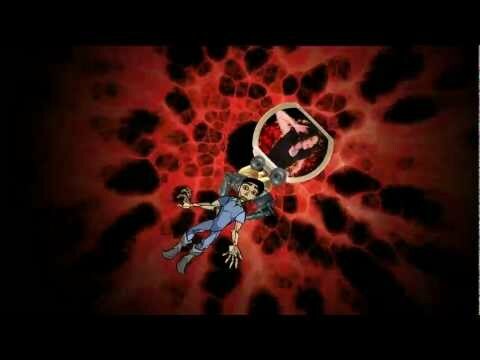 Watch for compelling new video graphics being developed by ZCollective in partnership with Manovill Records. The Eljuri Reggae Tour will extend from 2019 through 2020. Concerts have been announced for August 8, 2019 at Joe’s Pub in New York City and August 10, 2019 on the Volksplatz World Music Stage at Musikfest in Bethlehem, PA.
Nueva York, NY - Manovill Records hace hoy la presentación de `Resiste: La Colección Reggae de Eljuri' disponible ya en todas las plataformas digitales. A través de su propia y poderosa música reggae, Cecilia Villar Eljuri se inspira como artivista para expresar nuestros tiempos difíciles con su cuarto disco como solista. "La música reggae nos une.... te quita los problemas y te hace sentir bien. Quiero difundir la sabiduría y los ritmos del reggae a través de las fronteras de la cultura, el idioma y la nacionalidad, y dar mi voz a una fuerza que pueda ayudar a crear un cambio positivo". – Eljuri. La colección incluye canciones originales de Eljuri, incluyendo tres temas escritos junto con el infame dúo de reggae: Sly & Robbie. Sus canciones 'Una Ola' y 'El Aire' recibieron una fuerte rotación en la radio terrestre y satelital y fueron promocionadas como 'roots reggae' por Dermot Hussey, el legendario locutor y musicólogo. Proclamada como una de las mejores guitarristas Latinx en el mundo, Eljuri ha estado profundizando en su mundo de la guitarra y explorando nuevos sonidos para sus presentaciones en vivo. Estén atentos a los nuevos y convincentes gráficos de vídeo que está desarrollando ZCollective en colaboración con Manovill Records. El Eljuri Reggae Tour se extenderá desde 2019 hasta 2020. Se han anunciado conciertos para el 8 de agosto de 2019 en el Joe's Pub de la ciudad de Nueva York y el 10 de agosto de 2019 en el Volksplatz World Music Stage en el Musikfest de Bethlehem, Pensilvania. 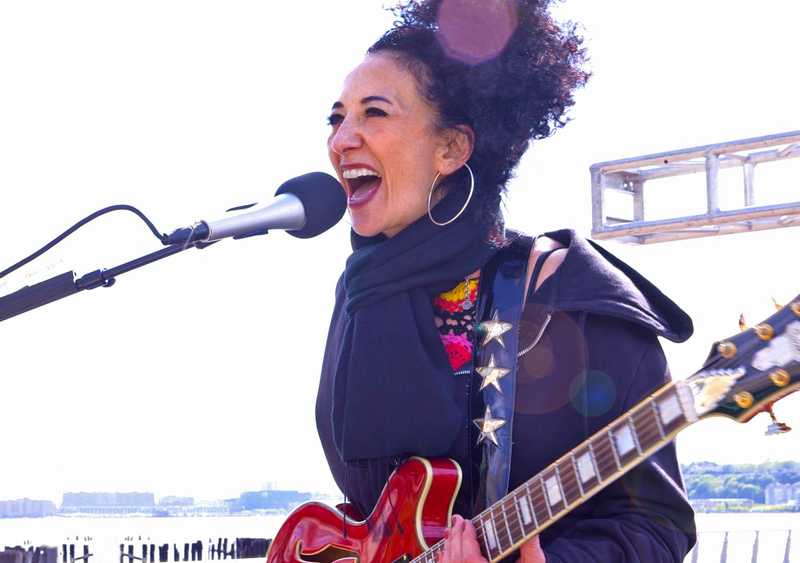 New York, NY – Cecilia Villar Eljuri is following up her politically charged single, ‘Keep it Up’, released in the fall of 2018, with a reggae project. The contribution of reggae music “to international discourse on issues of injustice, resistance, love and humanity underscores the dynamics of the element as being at once cerebral, socio-political, sensual and spiritual," UNESCO said in a statement when they inscribed ‘Reggae’ to the Representative List of the Intangible Cultural Heritage of Humanity this past November. 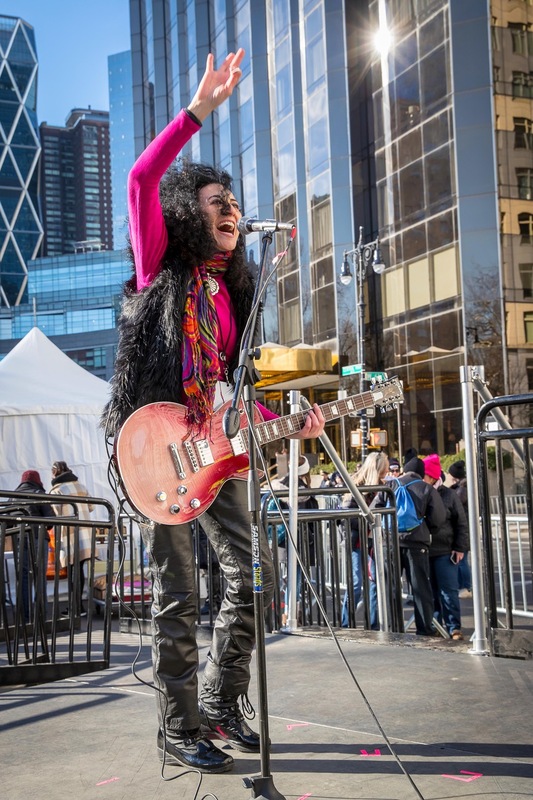 Touted as one of the top Latinx guitar players in the world and through her partnership with Sound Thinking NYC (CUNY and the NYC Mayor’s Office of Media and Entertainment), Eljuri will be mentoring NYC High School girls interested in entering any aspect of the music business. She will lead a Guitar Masterclass April 20th and additional workshops through the summer of 2019. 10/19/2018, Single Release, " ‘Keep it Up’." New York, NY - Appalled and enraged by current political and social turmoil, Cecilia Villar Eljuri is once again turning to her music to express her frustration. 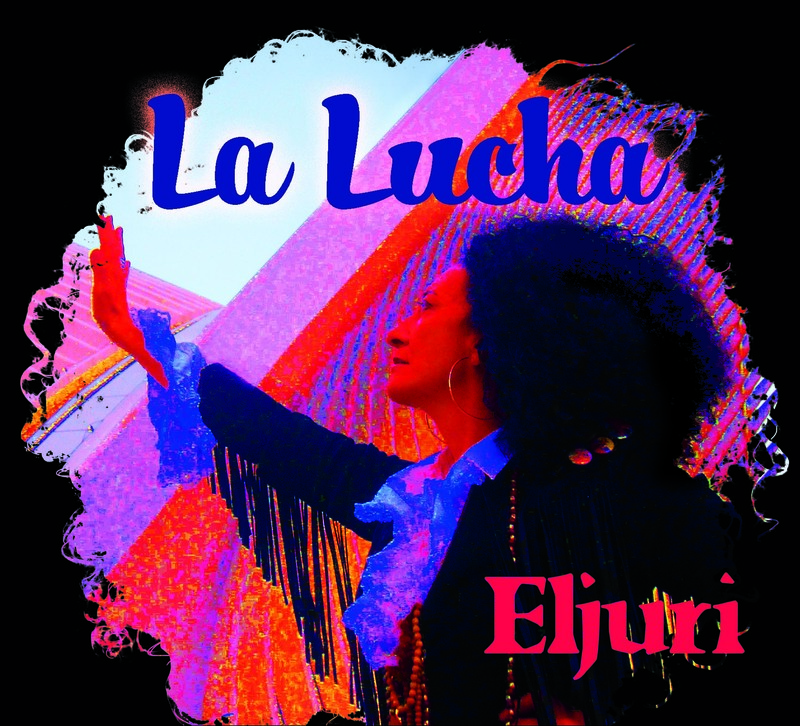 Following her critically acclaimed album ‘La Lucha’, Eljuri has written a motivating theme to inspire her sisters and brothers who are in the fight against injustice for the long haul. Her message and the title of the track is ‘Keep it Up’. 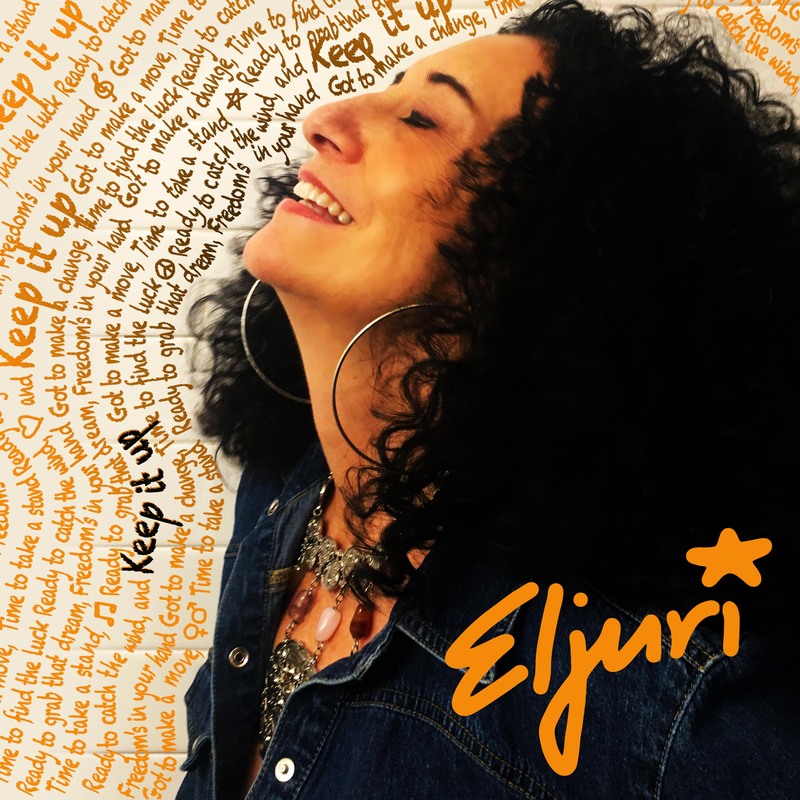 Caught off guard and inspired by this undeniable tune, Eljuri and her label Manovill Records decided to record and produce ‘Keep It Up’ in time to release the song before the 2018 midterm elections in the United States. This is the first time Eljuri has released a single independent of an album. Currently she is working on a reggae project to be released in early 2019 with which she plans to tour in 2019-2020. Eljuri reaffirms her original sound on ‘Keep It Up’ with her funky guitar and hooky bilingual vocal riffs. Tapping on her New York City hometown team to execute her vision, Cecilia (vocals/guitars/synth) called on Alex Alexander (drums/percussion) for his perfect pocket grooves and Johnny Pisano (bass) to rock and reflect her music. This little gem came together in the perfect vibe of NYC’s Downtown Music Studios with recording engineers Juan ‘Saucy’ Peña and Zach Hancock. Release date: Friday October 19, 2018 via all streaming services. Cecilia Villar Eljuri: Lead vocals and harmonies, electric and acoustic guitars, piano, synthesizer, midi-horns and strings. Believe the hype: Eljuri is one of the world’s best guitarists. Born in Ecuador, raised in New York City, she is also a powerful voice calling out violence, injustice, and prejudice in the US, at a time when such voices are desperately needed. 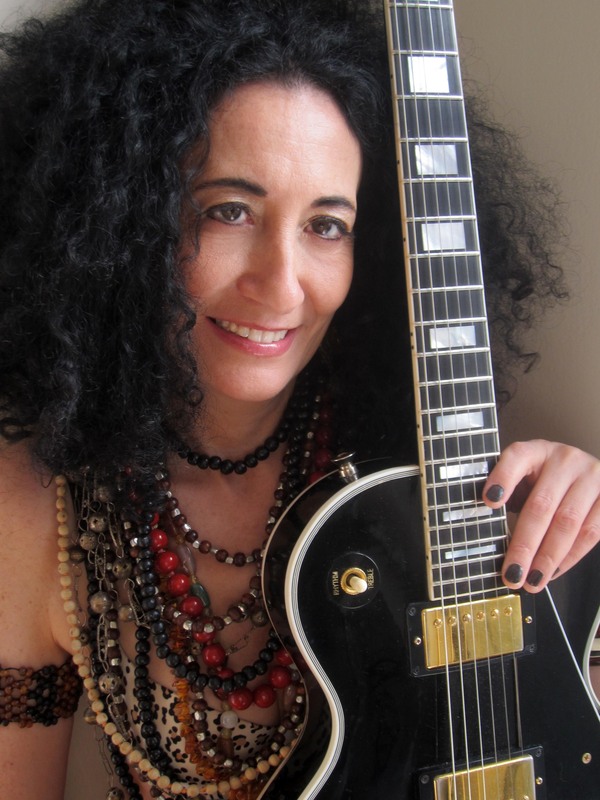 An award-winning songwriter and frequent protest singer, Eljuri “bounces confidently between fiery Santana-esque rock, reggae, Motown pop, and Cuban dance rhythms,” (Village Voice) weaving in a hearty dose of rhythms from around the world in the process. Now, after years of regular touring in the Americas, she is bringing her signature take planet-spanning rock to the UK, to celebrate her new global partnership with UK-based Anara Publishing and her ongoing ties to the Gibson guitar family. On June 28, 2018, Eljuri will give an intimate performance at the storied Gibson showroom in central London. 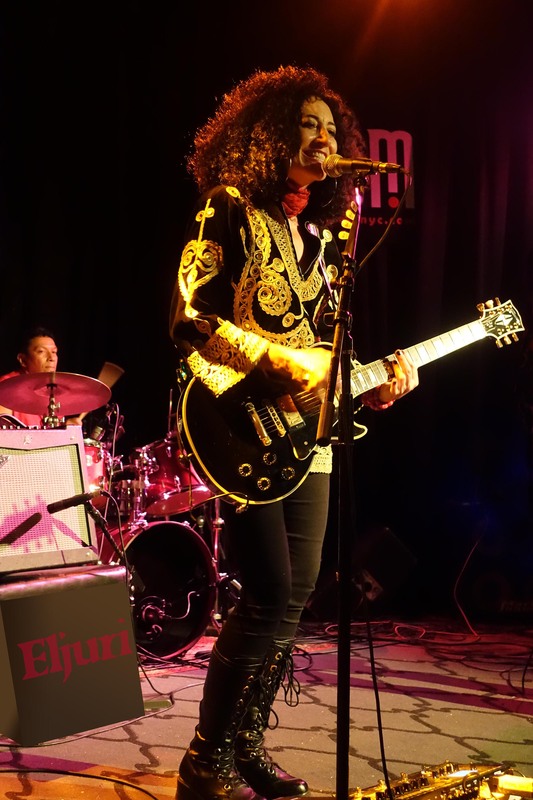 The venue, which has witnessed landmark shows by everyone from Slash to Amy Winehouse, will bring a select audience to hear a rare solo performance of Eljuri’s songs from her recent album, La Lucha. Eljuri speaks out against gun violence (“Bang Bang”) and made her anthems of pride and rebellion (“La Lucha”) integral parts of the Women’s Marches in her hometown. Her collaboration with Anara marks the next stage on this journey, as the publishers will advocate to bring her unique voice into more places. Anara Publishing is an independent music publisher headquartered in the UK and with offices in India. Representing an eclectic roster of artists and composers from around the globe, they ensure that their catalogue collects the publishing royalties it is entitled to. They also offer sync licensing opportunities for their roster, providing cutting edge music to media projects such as film, television and advertising. Anara Publishing began working with Eljuri after meeting with her label and management team at WOMEX in 2017. When first hearing her music, they were impressed with the power of her voice and uplifting guitar rhythms and immediately knew that she would add a uniqueness to their roster. 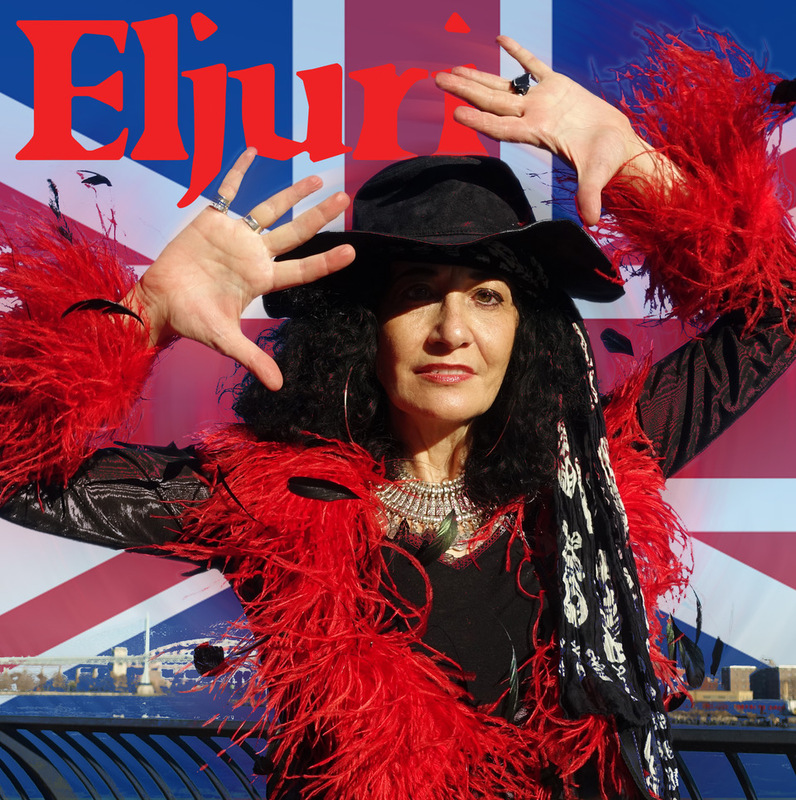 With their connections within the sync side of the music industry, they are able to bring Eljuri's music across the pond and promote her sound to music supervisors based in the UK, Europe and beyond. Gibson Brands was founded in 1902 and is headquartered in Nashville, Tennessee. Next to the #1 guitar brand, Gibson, the company’s family of brands includes Epiphone and KRK Systems. Gibson’s London Entertainment Relations showroom is responsible for all brand building activities. This includes artist relations, product visibility in film/tv/commercials, strategic marketing partnerships, lifestyle PR, and content creation. 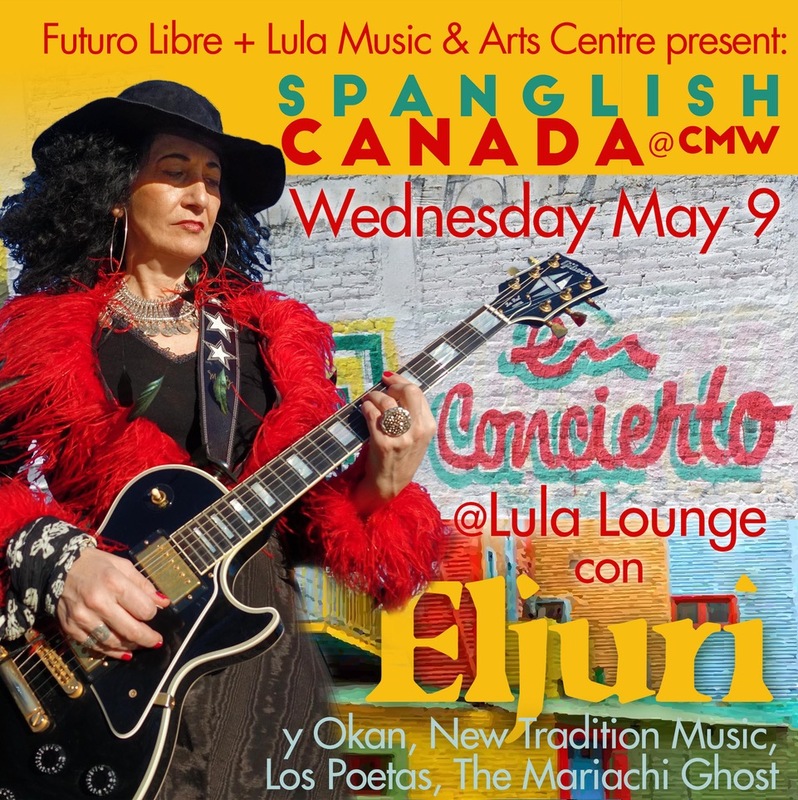 Eljuri has been invited by Futuro Libre and Lula Lounge to perform in their showcase, ‘Spanglish Canada’ on Wednesday May 9th during Canadian Music Week 2018 in Toronto. Canada has welcomed and celebrated Eljuri and her music since her debut live performance at the Luminato Festival in 2015. The Eljuri power-trio (Cecilia Villar Eljuri, lead vocals, guitar; Alex Alexander, drums; Winston Roye, bass) will share many favorite songs from all three of her albums including her latest single, 'Sálvame’ which showcases all that Eljuri’s music is and represents. The song blends her two spoken tongues English and Spanish and fuses her musical styles from Anglo rock funk to Latino son cubano rhythms. Eljuri describes that, "Life and our love for one another will save us and can lift us out of the mire we currently find ourselves in.” She shares that the electric guitar solo she plays on ‘Sálvame’ is among her very favorites from her album, ‘La Lucha’. Manovill Records presents a private event at the iconic Gibson Showroom in London, England focusing on the artist, Cecilia Villar Eljuri, her songs, socially conscious message and guitar prowess in order to introduce her to British/European World Music media. Anara Publishing, Eljuri’s new worldwide publishing partner will give industry partners this chance to get to know the celebrated musician and her songs in an intimate setting. Singer-songwriter, guitarist and ‘artivist’ Cecilia Villar Eljuri releases her powerful new music video, BangBang. Witnessing the chaos and brutality inflicted on citizens across the globe motivated Eljuri to write this anti-gun violence song. From the riots in Ferguson to the mass shootings in Paris and countless cases of police brutality, Eljuri bears witness and asks how many more souls must be offered up to this indignity. She raises her voice in protest while wielding her strongest weapon, the guitar. The lilting rhythm of reggae in ‘BangBang’ merges with bursts of ska showing off Eljuri’s guitar prowess, accompanied by classic Jamaican bass and percussive styling by Tracy Wormworth and Alex Alexander. The creative video team of Kristian Austin and Olga Mazurkiewicz (Queen City Films / ZCollective) were tapped to direct, film and produce the performance video ‘BangBang’ under the executive production of Alexandra Gatje from Manovill Records. The video stars Cecilia Villar Eljuri on vocals and guitar, Alex Alexander on drums and Johnny Pisano on bass. Hot News: Eljuri’s song BangBang, was just selected as a winner of the John Lennon International Songwriting Contest (World), September 2017. BangBang is the third single from Eljuri’s critically acclaimed album ‘La Lucha’ released by Manovill Records. 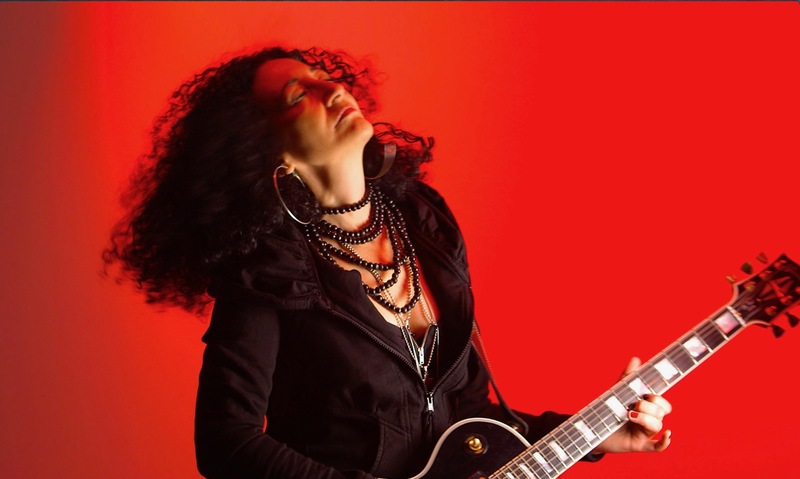 Born in Ecuador, raised in NYC, Eljuri is touted as one of the top Latina guitarists in the world and has been a member of the Gibson family of guitarists since 2008. Eljuri navigates through musical landscapes ranging from rock, funk, bolero, reggae, and Afro-Cuban rhythms, all presented with an elegant and empowered female voice. She tours internationally as a power trio, performing her infectious grooves, spreading her uplifting message, and affecting positive social change. Eljuri is honored to donate 100% of her proceeds from this concert to the NYCLU. The Brooklyn Commons welcomes Eljuri and her percussionist, Alex Alexander to perform at the 43rd Annual Atlantic Antic. They will perform two sets from 3:30 to 5:30pm, Sunday September 24, 2017 at 388 Atlantic Avenue, Brooklyn, NY. The Atlantic Antic™ is a living tribute to the myriad of heritages that coexist in Brooklyn. Brooklyn’s largest festival transforms Atlantic Avenue into a sea of free entertainment offering something for everyone. For an electric guitarist in love with the Cuban tres, for a Latina raised in Manhattan in a tight-knit family of artists, it was a logical next move. From raw-edged rock through alt-Latin exploration, Eljuri has found ever tighter songs, with an increasingly expansive feel and perspective that burst through on La Lucha (release: October 14, 2016). That respect blossoms into songs that are both hooky and nuanced, including a reimagined version of a tango her mother released on 78 (“Indiferencia”) and a collaboration with reggae icons Sly & Robbie (“Quiero Saber”). 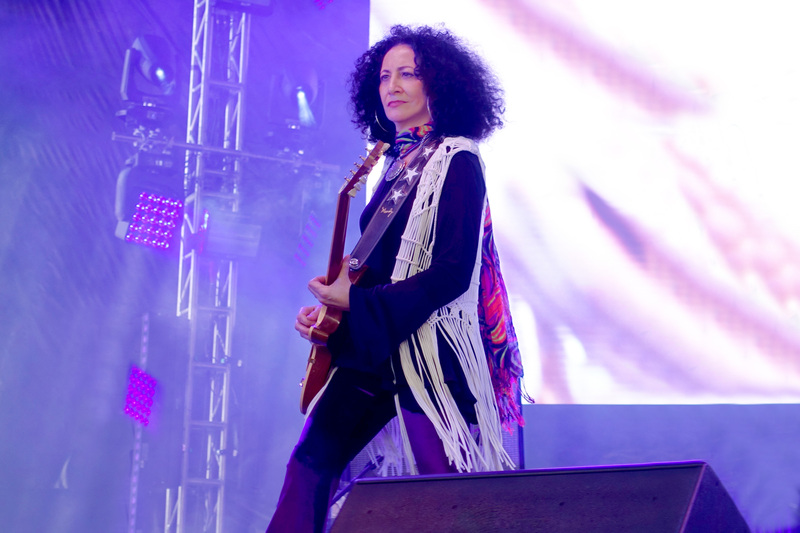 Eljuri’s guitar work, so strong critics have dubbed her “Carlita” with a hat tip to Santana, stretches out, finding a balance of melodic and rhythmic moments, for a sound that’s potent yet reflective. “I wanted to get more into my Lebanese roots,” inherited from her mother, “and to let the Latin side rip more,” Eljuri says. As a girl, Eljuri studied piano and got into the mandolin. Then she discovered electric guitar. She fell in love, began writing her own songs, started rock bands, and was playing CBGBs by her teens. Experimentation runs throughout La Lucha. “‘Luz Roja’ is a very different song and arrangement for me,” muses Eljuri. “I wanted it to have a different pulse than other songs I’ve written in the past, more four on the floor, with with pulsating keyboards and caja vallenata. Yet the guitar is very exploratory and loose, more free flowing.” In the adventuresome “Nunca Volveré” (which Eljuri calls ‘an immigrant’s tale’), she digs deeper into her Lebanese roots with driving dumbek, finger cymbals, and Arabic infused chants, entwined with Zeppelin-style electric guitar and rock drums. There’s been a shift in Eljuri’s point of view, as well, an inward look at how the world shapes and challenges us. The rocker’s hard-edged rebellion has been tempered, though she still tells it like it is on the stirring call to address gun violence, “BangBang.” Much of the fight on La Lucha is internal: Many songs urge listeners to start inside first, then move outward and shake up the world. “Injusticia,” for example, imagines a conversation between friends that catches fire and takes them outside, to the streets, flowing into a movement. “It’s very introspective. It’s simmering at the beginning, a circle of friends, in an intimate surrounding,” Eljuri notes. “Then it breaks out with the solo, a dark, rich, fat solo, then you feel the chants, the movement at the end. 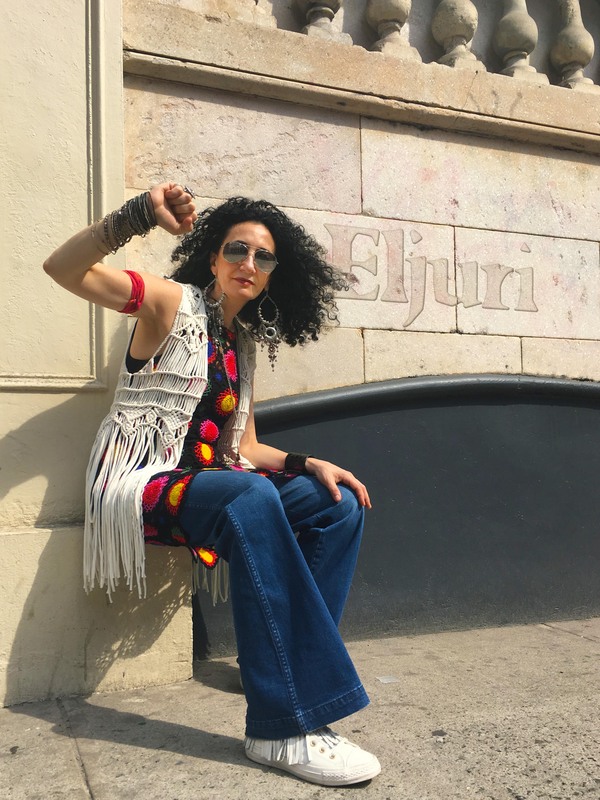 That’s the way I feel: That’s what we have to do.” On the title track, with the funky, latin groove of “La Lucha”, Eljuri appeals to the listener to raise their voice to fight for a better world. 08/08/201608/09/2016, El primer sencillo "El Viento" del próximo álbum de Eljuri "La Lucha" se lanzo hoy. El primer sencillo "El Viento" del próximo álbum de Eljuri "La Lucha" se lanzo hoy. Con sus canciones y guitarra, Eljuri viaja a través de paisajes musicales que van desde el rock y el pop-punk, hasta el bolero, pasando por el reggae y los ritmos afro-caribeños, todo esto presentado con elegancia y una voz femenina y empoderada. Acercarse a “El Viento”, es establecer una conexión directa con sus autoproclamados tradiciones como una ‘Ecua-Gringa’ en su música. La melancolía latinoamericana es atinadamente valorada en este bolero romántico, primer sencillo del álbum, “La Lucha” mediante el cual es fácil remitirnos a los grandes bailes de salón y la sensualidad caribeña. Las guitarras hacen homenaje a los ritmos afro-latinos, y adornan un invento musical bastante peculiar: el laudero personal de Eljuri construyó por encargo un tres eléctrico que ella imaginó. El sencillo 'El Viento', producido por Cecilia Villar Eljuri está disponible para su descarga en iTunes, Amazon, Google Music; streaming en Spotify, iHeartRadio, eMusic y de los principales puntos de venta digitales. Se lanza el nuevo video músical en YouTube 19 de agosto 2016. “El Viento” the lead single from Eljuri’s upcoming album “La Lucha” drops today. 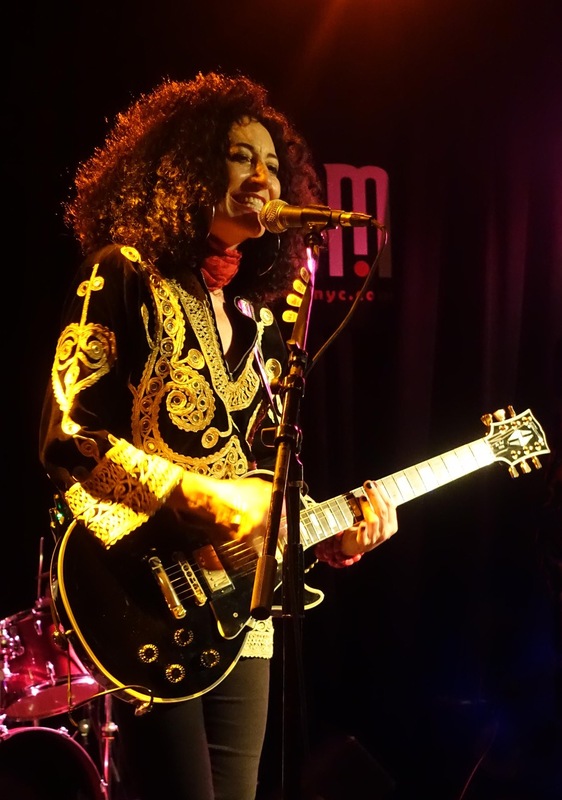 With her songs and guitar, Eljuri travels through musical landscapes ranging from rock and pop-punk, to the bolero, reggae and Afro-Caribbean rhythms, all presented with an empowered yet elegant female voice. Getting to know “El Viento” (The Wind), establishes a direct connection with her self proclaimed traditions as a ‘Latin from Manhattan’. This romantic bolero filled with Latin American melancholy, is the lead single from the upcoming album, “La Lucha” (The Fight) and recalls great ballroom dancing and Caribbean sensuality. 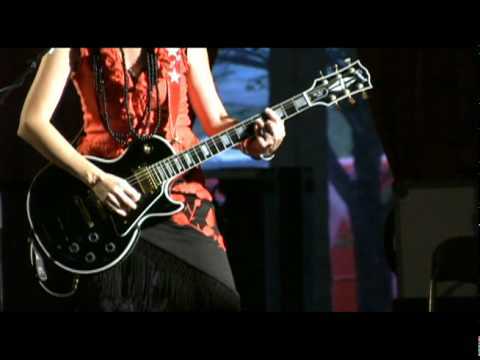 Doing homage to traditional Latin rhythms and harmonics, the lead guitar used on the solo of this song is one of Eljuri’s own invention, an electric tres, custom built for her by her personal luthier. The single 'El Viento', produced by Cecilia Villar Eljuri is available for download on iTunes, Amazon, Google Music; streaming on Spotify, iHeartRadio, eMusic and all major digital outlets. The accompanying music video debuts on YouTube Friday August 19, 2016.